Anyone who knows me knows I love being in the water. All summer long I am in every open water event and group I can get my hands on but most of all I live for getting to the ocean. I think about it daily. I dream about it. I LOVE the ocean. I love the waves, swimming, beach and snorkeling to see all the beautiful aquatic life. So naturally I love Finding Nemo! Pixar really knocked it out of the park on this one. It had been a while since I had seen it and I honestly regret not putting it on my Most Artistic Animated Films list. It’s stunning. 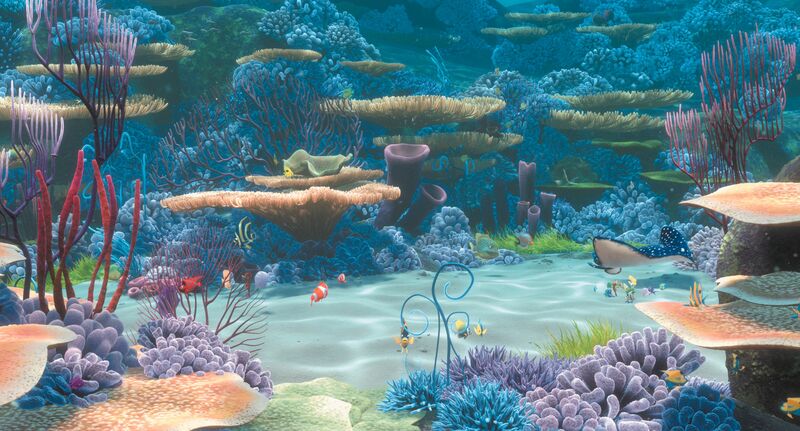 I mean look at these images and how every inch is animated with sea life and colors. They are so good at keeping the fishes and water moving while they are talking and having their facial characteristics look natural (unlike Dreamworks Shark Tale…). It looks like if a clown fish was going to talk that’s how their mouths would move. Nothing feels off-putting or grotesque (again unlike Shark Tale). But all that would mean nothing if the story wasn’t great (remember It’s All About the Story). Luckily the story is even better than the visuals. This last time I really paid attention to little moments of great writing. I totally see why it was nominated for Best Original Screenplay which is a huge rarity for an animated film. 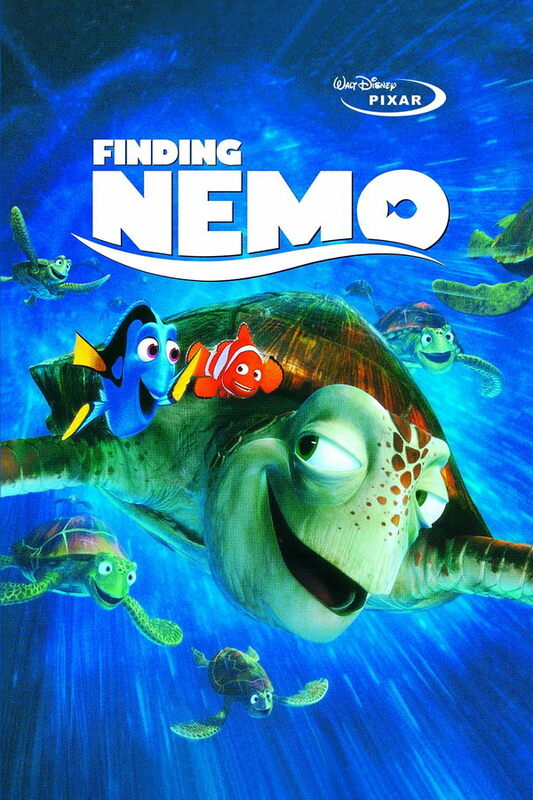 If you don’t know the story is an adventure about a widower clownfish named Marlin (Albert Brooks) who has to go on a journey to find his son Nemo who has been taken by a dentist in Sydney, Australia. The film starts out very sad and without giving too much away Marlin promises his son that he ‘will never let anything happen to him”. Thinking he is being loving, he is overprotective and Nemo even says that he hates his father and it’s hard to blame him with how neurotic he is. Meanwhile Nemo is off to the dentist office where he meets a group of aquarium fish most of whom are from pet stores. Except Gill who is from the ocean and dreams of escaping and going back. These sections are an entirely different color palate than the ocean but it is fabulous. Gil is pretty down-trodden for a Disney film (kind of like Eeyore) but he believes in Nemo (or Sharkbait as they call him) in a way Marlin doesn’t. 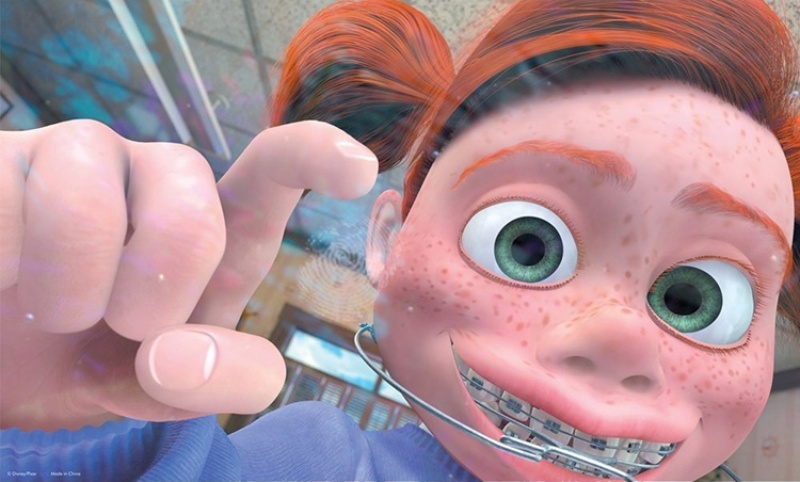 Everyone in the aquarium is most afraid of becoming toilet fodder for the dentist’s niece Darla- the true villain of the film! So funny! Marlin gets stopped on his trip several times including a hilarious segment with 3 sharks going to an AA type meeting for eating fish. “Fish are friends not food”. When you see these giant sharks it is the last thing you expect and so funny. They also have a gorgeously animated sequence in a jellyfish colony. 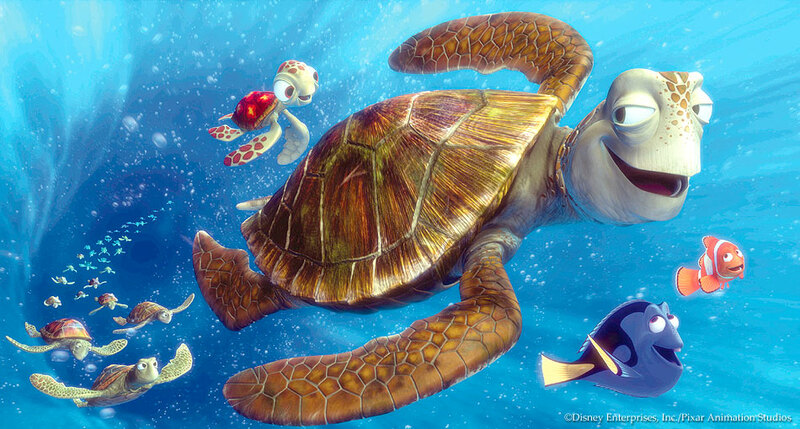 Marlin is rescued from the jellys by a turtle named Crush who is also very funny. I love his line “Dude, you’ve got some serious thrill issues”. However, Crush isn’t just a throwaway comedic character. He actually teaches Marlin something about parenting and letting your little one’s make mistakes and try things on their own. Like the sharks he defies expectations. When they actually get to Sydney the writers solve how he can possibly get to the dentists office by a bird named Nigel who knows the aquarium fish and likes to watch extractions. 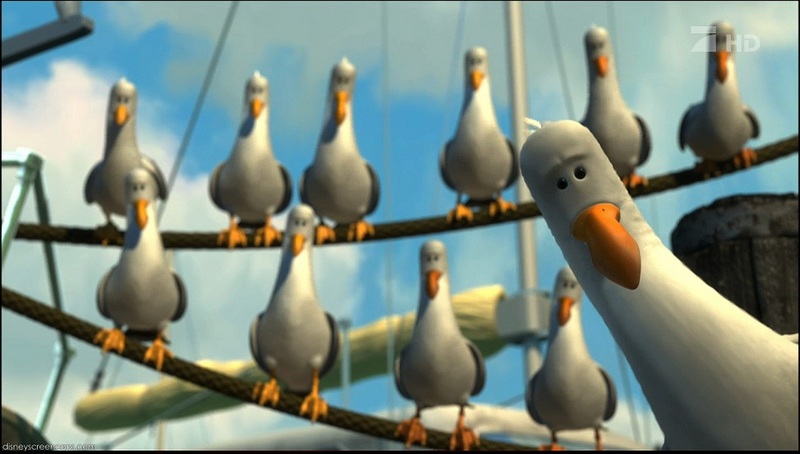 He also saves them from one of the best gags in the movie- the seagulls who say exactly what most would guess a seagull would say ‘mine, mine, mine, mine’. So funny. There are so many other great parts. 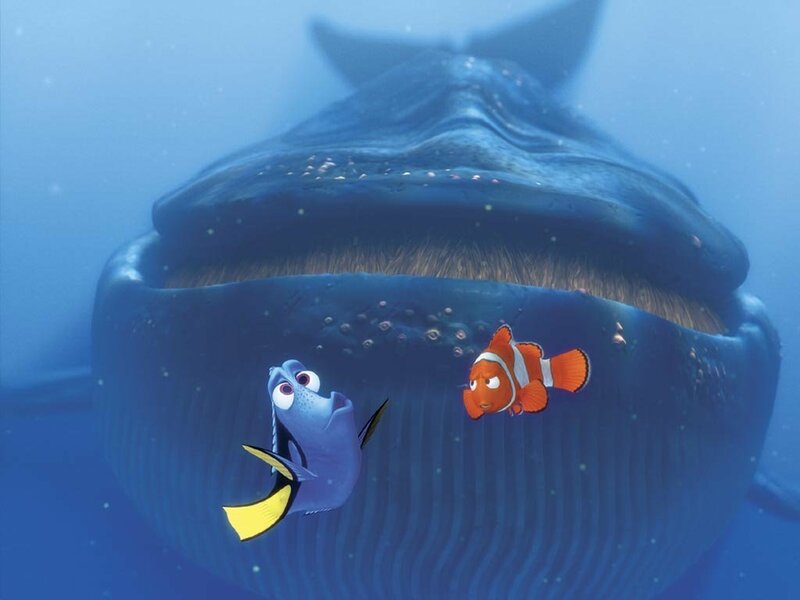 Like I love Dory speaking whale and Marlin thinking she is nuts. 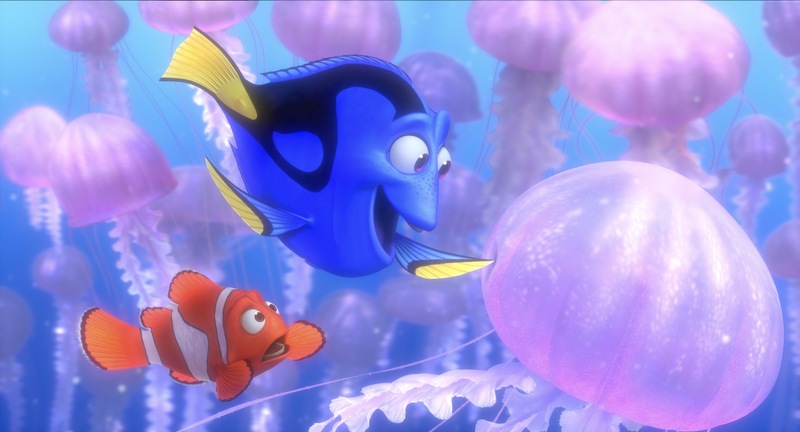 (Despite her memory Dory is one of the smartest characters in the film). The voice cast is as good as it gets with famous names but more importantly voices that work. 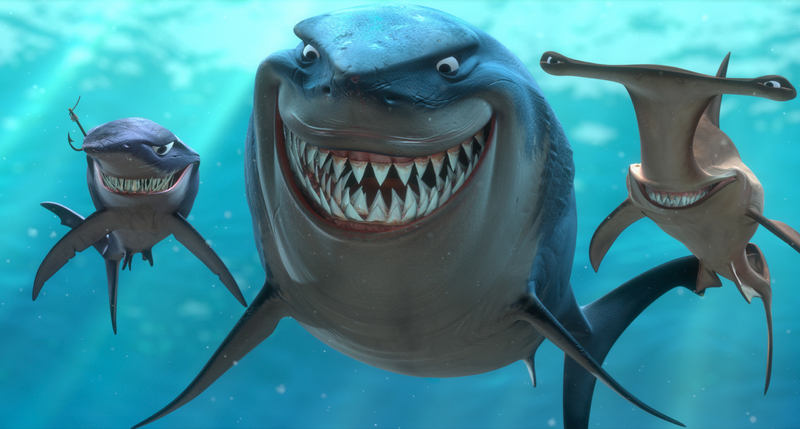 Again unlike Shark Tale, these are voices that make sense for the story not just the celebrity. We get DeGeneres, Brooks, William Dafoe (Gill), Brad Garrett (Bloat), Alison Janney (Peach), Stephen Root (Bubbles), Geoffrey Rush (Nigel), the list goes on…they are all perfectly cast. It’s exciting, sweet, touching, scary, tragic (especially beginning) and absolutely hilarious all at the same time. Mostly it’s a movie the entire family will love and it is stunningly beautiful at the same time. And I won’t give it away but the ending is perfect. 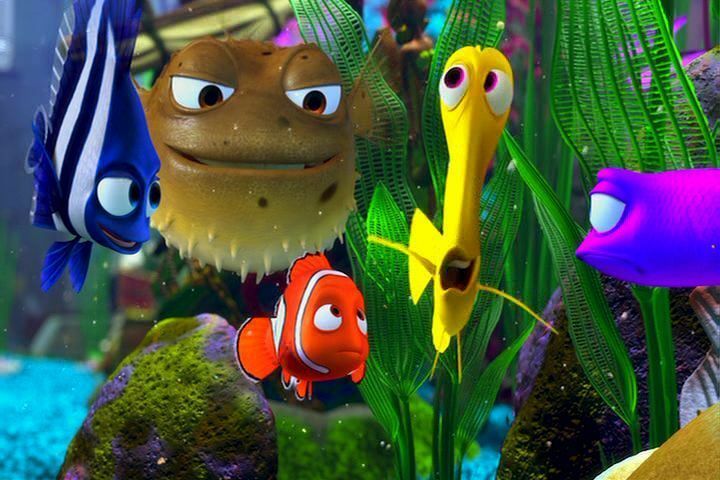 It shows all that Marlin, Nemo and Dory have learned from their journey and it makes me want to cheer. They could have just ended it with the rescue but they don’t. They take it a step further and show the real growth. 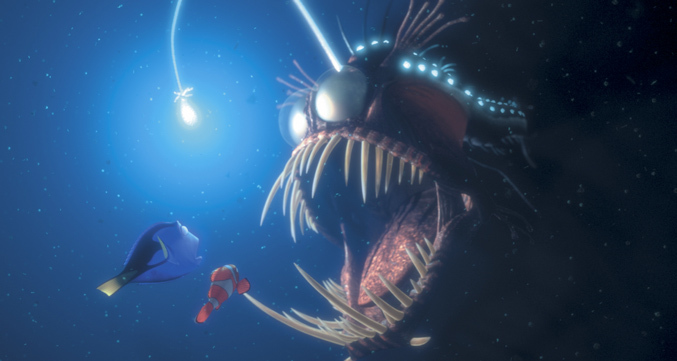 It is movies like Finding Nemo that make a Pixar ranking almost impossible. I sincerely believe they have 8 films that are close to perfect. How the heck do you rate a Wall-e vs Ratatouille vs Finding Nemo vs Toy Story movies? They are all total delights. That says something for a studio when you have 9 pictures including Monsters Inc that are so exemplary. Amazing! 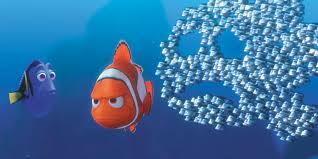 I really have no criticisms of Finding Nemo. I had my computer out ready to write them. The music is away from Randy Newman to his cousin Thomas Newman (very musical family!) but it has a very different feel of the previous Pixar films. “Hey clown boy, let the lady guess” School of fishes. 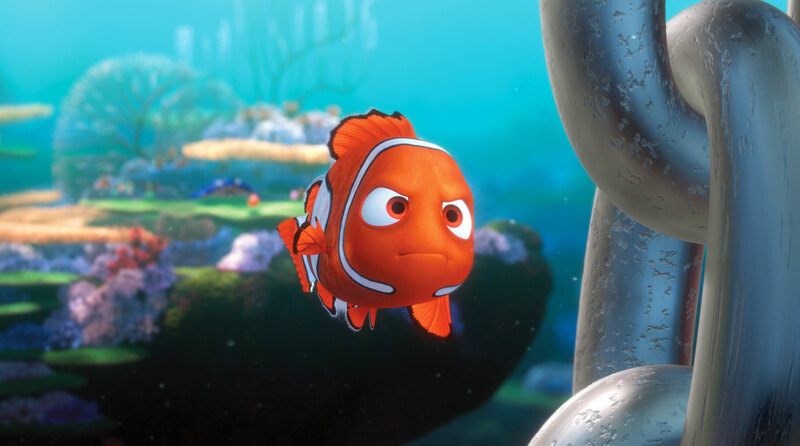 “He’s not very funny for a clown fish” Fish parents. That’s just a handful of the great writing. It looks fabulous. It has great characters and a good story. What more can you ask for? Overall Grade- A+ (I told you before doing this project there would be a lot of those!). The only content recommendation is for very small children I might just start at the first day of school as the beginning scene may be a little too upsetting for them. Finding Nemo is one of my all time favorites. It’s a great road trip movie, it’s a great family movie, it’s a great animated movie, it’s simply a great movie. I wouldn’t give it anything less than an A+. Great review! This film will always be special to me because it was the first movie I ever saw in the theaters. And even if I didn’t see it in theaters, it’s a pretty good movie. It’s one of the best. I loved it! That first movie we see in the theaters is always a special one. I think because it was a special event, something that didn’t happen every day so I felt special. I know that’s part of reason I have fondness for Little Mermaid and Home Alone. 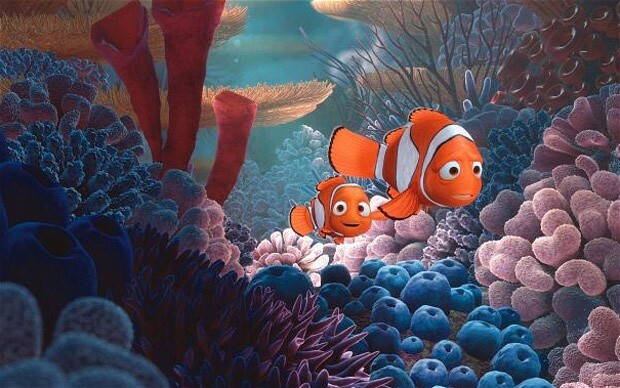 But honestly it had been a few years since I’d watched Finding Nemo and it was even better than I remembered it. Was The Little Mermaid your first theaters movie? Awesome review once again! This film is one of my favorites, if not my all time favorite from Pixar as well. I watched part of it on the plane on the way to Florida and back a couple years ago. I’ll definitely try to watch the rest of it soon. Love this film a lot. Every time I watch this movie I’m blown away by how beautiful it is. And a great story too. 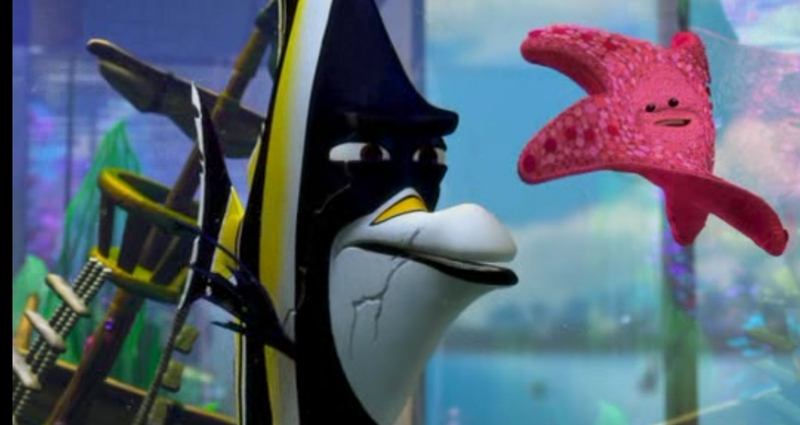 I love Marlin’s character – as a worrier, I can relate to him! Pingback: Pixar Review 15: The Incredibles | Reviewing All 54 Disney Animated Films And More! 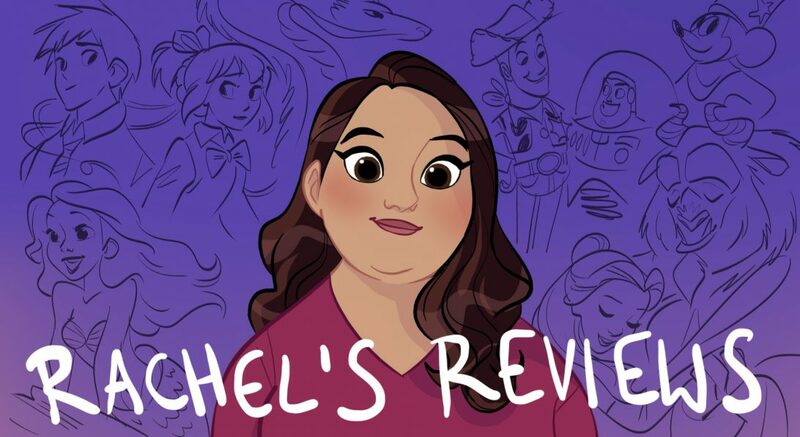 Pingback: Rachel’s Top 50 Animation Countdown (20-11) | Reviewing All 54 Disney Animated Films And More! For me, in spite of all the humour and quirky characters, that sense of tragedy was never far away from the surface every time I watched it. 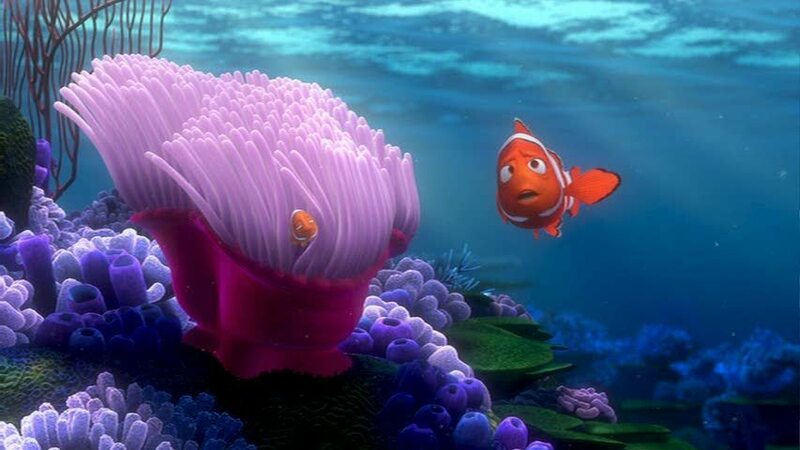 Of course this works to the film’s advantage and gives Marlin an understandable reason why he’s so protective of Nemo. Also I forgot to mention, but as well as Brooks and De Generes as Marlin and Dory, I always liked Willem Dafoe as Gil – a warm and reassuring presence despite my prior association with him in the Spider-Man films as the Green Goblin. Pingback: Did the Right Film Win? 2003 Animated Oscars | Reviewing All 54 Disney Animated Films And More! Pingback: Good Dinosaur 2nd Full Trailer Review | Reviewing All 54 Disney Animated Films And More! 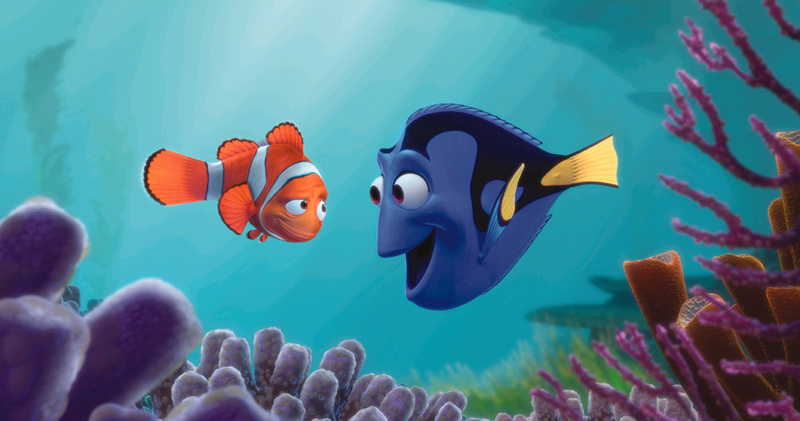 Pingback: Finding Dory Teaser Trailer Thoughts | Reviewing All 54 Disney Animated Films And More!